After a traffic stop, how long can you be detained by police before a drug sniff dog arrives to search your car? The Unites States Supreme Court, for the third time in the last few years answers the question. Out of Nebraska comes Rodriguez vs. United States. The case involves a motorist who is stopped for a traffic violation but who is detained long enough for the police to call in a drug sniff dog to investigate his car. The additional time allowed for a drug sniff dog to arrive and alert to illegal drugs in the vehicle. The issue concerning the Court is the elapsed time between the stopping of the vehicle and the time in which the dug sniff dog is called in to search the car. Rodriguez asked the Court to throw out the drug search due to the amount of time that elapsed from the initial traffic stop and the time it took to call in the drug sniff dog. The police countered claiming that additional time was needed for a back up officer to arrive. 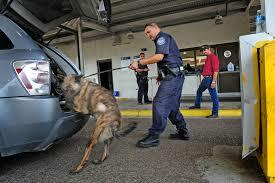 The Court ultimately ruled that, “Absent reasonable suspicion, police extension of a traffic stop in order to conduct a dog sniff violates the Constitution’s shield against unreasonable seizures. This ruling was joined by Chief Justice John Roberts and Justices Antonin Scalia, Stephen Breyer, Sonia Sotomayor and Elena Kagan, in a 6-3 decision. So, how does this translate to your Winter Park vehicle stop and subsequent drug dog search? Justice Ginsburg states: “[T]he tolerable duration of police inquiries in the traffic-stop context is determined by the seizure’s ‘mission’ — to address the traffic violation that warranted the stop,” Ginsburg said. “Authority for the seizure thus ends when tasks tied to the traffic infraction are — or reasonably should have been — completed.” In plane terms, police can only detain a driver the amount of time it should reasonably take to complete writing a ticket. Any longer can be challenged in court as being illegal, which can result in anything found after that time has passed as being illegally obtained by law enforcement.